Updated: Flash-based storage provider Nimble Storage has closed a $40.7 million mezzanine round months ahead of schedule, as investors are lining up to get a piece of the next big storage initial public offering. Sequoia Capital and Accel Partners led the round, which brings Nimble’s total funding to $98 million and puts its valuation in the range of other recent storage-industry success stories Data Domain (s emc) and 3PAR (s hpq), according to CEO Suresh Vasudevan. Update: Nimble has been remarkably successful since it began shipping its hybrid flash-plus-hard-drive gear two years ago. The company, which focuses on small and mid-size enterprises, has amassed more than 1,100 deployments across more than 600 customers and hopes to be bringing in quarterly revenue between $25 million and $35 million relatively soon, Vasudevan said during a recent interview. It comes up against large vendors such as NetApp (s ntap), Dell (s dell) and EMC (s emc) about 85 percent of the time, he added, and it typically wins those deals. Flash storage is a white-hot market right now because of the significant performance and efficiency improvements it provides over hard drives — important considerations in a world where virtualization reigns supreme — and because the gap in price between the two is closing fast. In the past several months, EMC paid $430 million for all-flash startup XtremIO, while Violin Memory ($80 million) and Pure Storage ($40 million) have both brought in hefty investments. Nutanix and Tintri, both of which, like Nimble, fuse flash and hard drives and target mid-market businesses, recently raised $33 million and $25 million, respectively. Putting both flash drives and hard disks in the same array means customers can save money on bulk storage while still getting the flash performance boost where it’s needed. As I explained when covering Nimble’s previous funding round in July 2011, customers seem to love the flexibility of its appliances. 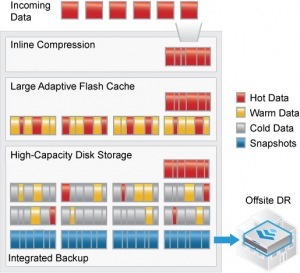 They can change the ratio of flash to hard to disk capacity to suit their needs, and some customers even use a single Nimble appliance for both primary storage and backup (with hot data in flash and backup data on the spinning disks). Nimble is eyeing late 2013 or or 2014 for its IPO, Vasudevan said, although it raised its final funding six to nine months before it planned to because outside firms kept approaching it with aggressive and attractive term sheets. In the end, Nimble took money from all of its existing investors as well as newcomer GGV Capital. Vasudevan said the new investment will help fuel international expansion as well as a planned surge in headcount over the next 18 months. NexGen Storage launched their product 18 months after Nimble and has a much better, sustainable architecture that takes advantage of emerging Solid State interface standards. Has Performance QoS – unheard of in the SAN industry. Is also 5x faster and higher capacity than Nimble at the same price. Those are some fighting words. Would love to see some proof or even an actual customer case study or two. I believe Nimble just published a 40,000 ESRP 3.0 Mailbox result.